The Super Bowl game each year is one of the most anticipated Sports Events of the year, especially for the men! It is another excuse to get together with friends and family, drink too much wine and beer, and over indulge on Super Bowl Food, which is typically just lots of Snacks! It's not unheard of, to sit and snack for hours on end! When is the Game? The Super Bowl game is always played on the First Sunday in February, so in 2019, it will be on Sunday, February 3, 2019. Kickoff will be at 6:30pm EST. Super Bowl Sunday, is one of the biggest drinking nights of the year, along with New Years Eve, St. Patrick's Day, and Thanksgiving Eve. Maroon 5 will be performing in the Half Time show. It is estimated that the Super Bowl commercials are costing between $5.1 and $5.3 million for a 30-second commercial spot! One of the reasons for this high price, is obviously the record number of people who will be watching the game, but also because the commercials are usually pretty spectacular, they tend to have more people actually watching the commercials than the game (like myself!!). 2019 is the 53nd anniversary of the Super Bowl game! The Patriots have been to ten previous Super Bowls and won five. Tom Brady has been honored with four Superbowl MVP awards. This is the annual championship game of the National Football League (NFL) for the previous season. 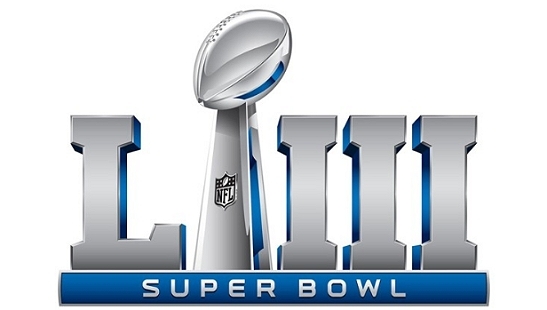 The game uses Roman numerals to identify each game, rather than the year in which it is held - XLVIII to determine the champion of the 2013 season, LIII for the 2019 season. It is the second largest day for U.S. food consumption, after Thanksgiving Day. The game is frequently one of the most watched television broadcasts of the year, and is also one of the most watched sports events in the World! Super Bowl XLV, played in 2011, became the most watched American television program in history, drawing an average audience of 111 million viewers! Many popular singers and musicians have performed during the event's pre-game and halftime ceremonies because of the exposure. It is a huge honor to be chosen to sing the National Anthem before the game. (2013 was Alicia Keys singing the National Anthem, and Beyonce performing during the half time show). Lamar Hunt, the owner of the American Football League's Kansas City Chiefs, first used the term "Super Bowl" to refer to this game and the term stuck. The National Football League's Green Bay Packers won the first two games. The game is played annually on a Sunday as the final game of the NFL Playoffs. The game is currently played on the first Sunday in February, although previously it had been held in January. February is televisions "Sweeps Month", so is a much better opportunity. The winning team receives the Vince Lombardi Trophy, named after the coach of the Green Bay Packers who won the first two games. The most games have been won by the Pittsburgh Steelers, who have won six games! The Dallas Cowboys and San Francisco 49ers have won five games each. The game in 2013, gave the 49ers a chance to tie it up for the most wins. The Green Bay Packers, and New York Giants have won four games each. Famous commercial campaigns include the Budweiser "Bud Bowl" campaign and the 1999 and 2000 dot-com ads. I've always loved the Budweiser Frogs and the beautiful Budweiser Clydesdale Horses. Advertisers payed as much as $3.5 million for a thirty-second spot during Super Bowl XLVI in 2012. Thirty minutes are allocated for the Super Bowl halftime show. Some of the first games included just marching bands from colleges or high schools, but now feature famous musical talents. Michael Jackson was the sole performer during the half time for Super Bowl XXVII in 1993. For the half time show Super Bowl XXXVI in 2002, U2 sang their "Where the Streets Have No Name" song, and played under a large projection screen which scrolled through names of the victims of the September 11 attacks. (I remember this as being incredibly emotional!!). The halftime show of Super Bowl XXXVIII in 2004 had the famous Justine Timberlake, and Janet Jackson "Wardrobe Malfunction" which caused considerable controversy. For me, as a "girl", when I watch the game, I'm usually more interested in the food, the half time show, and the great commercials during the game. Because of the large audience watching the game, the Commercials during the game are the most expensive of the year! Here was my favorite commercial from 2012 from Honda, promoting their 2012 Honda CR-V which looks like a great car. (I had a Honda CR-V for awhile, until I was overcome with a mid-life crisis and wanted to drive a sports car instead). The video above is called, "Matthew's Day Off" which is a take off on Matthew Broderick's, famous Ferris Bueller's Day Off Movie that he did years ago. In this Extended version of the commercial, Matthew calls in sick from work, then jams around town in his new Honda CRV, and at one point, runs into his boss on the road. I thought it was pretty hilarious! We'll be adding a page devoted to some of our favorite commercials soon! 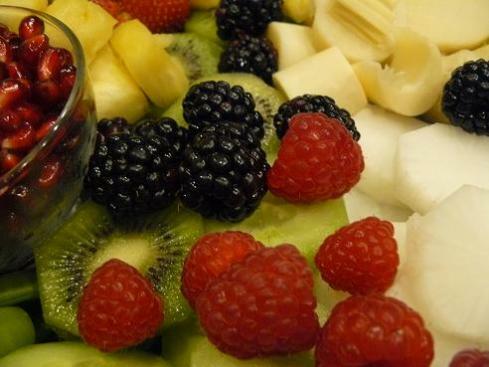 Super Bowl Snacks and Healthy Diet Habits to Practice. You'll feel so much better the next day! Also...check out our Tips on how to make Produce Trays like the professionals. Fill up on Fruits and Vegetables, so you can still splurge a bit on the rest! We also have a Pinterest Super Bowl Food Board on our Super Bowl Food page with some great ideas - lots of cute ideas, but look for the healthier items! 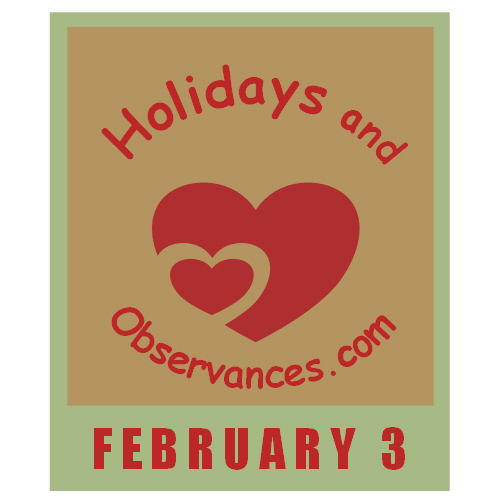 Please Follow our Holidays and Observances Super Bowl Sunday Holiday Board on Pinterest - below you will see our 30 most recent pins to this photo board! Click on the SEE ON PINTEREST bar right above, (link will open up in Pinterest), to see all the rest of our photo's on this board, and to Follow the board. New photos will be constantly added!